Exporter of a wide range of products which include ceramic band heaters for pvc processing. 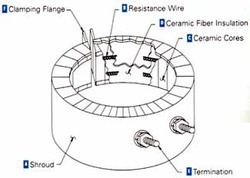 Our organization is counted amongst the most distinguished manufacturers, suppliers and exporter of a vast range of Ceramic Band Heaters for PVC Processing. These Ceramic Band Heaters for PVC Processing are manufactured using latest technology. Looking for Band Heaters for PVC Processing ?